Do you like Trendy Fashion Boutique? Share it with your friends. 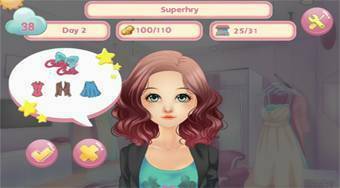 Trendy Fashion Boutique is a wonderfully crafted girl game in which you enter into the role of a young girl who has invested all her savings to buy her own boutique with clothing in the city center. Select a name for your boutique and then go to work. In each of twenty-five days, your task will be to earn the required amount of money to proceed to the next round. Choose your clothing and fashion accessories for your customers exactly according to their ideas and take care of their maximum satisfaction. For earned money, buy new brands and pieces of clothing for sale.